Nissan has already successfully launched the Leaf in its native Japan and the US, with the UK next on its list of nations which will be getting this advanced, electric vehicle. Consumers will be pleased to see a growing number of full-electric vehicles on the market, giving them alternatives to the petrol hybrids which have previously been prevalent from Nissan’s rivals Honda and Toyota. 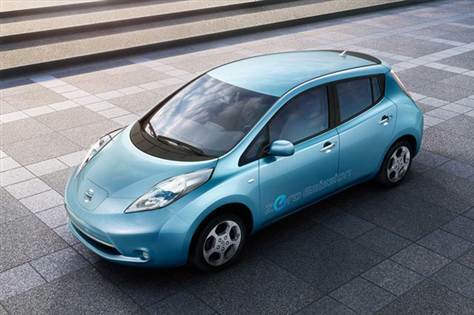 The Nissan Leaf keeps it simple, with a single model option that has the specifications you would wish to see from a technologically advanced vehicle. Its electric engine is one of the most impressive to yet feature in a car, with totally upgraded lithium-ion batteries powering it to deliver much more torque and straight line speed than in previous electric vehicles. Nissan states that it will be able to take four passengers and a driver a distance of 109 miles before it is necessary to recharge its cells, which is decent range for an electric vehicle. It is still not in the same league as petrol cars and it will be more expensive than a comparatively equipped petrol alternative. However, with no road tax to pay and Moneysupermarket car insurance quotes easily available online combined with the minute cost of electricity compared to petrol, the savings are made elsewhere over the life of the vehicle. There are all sorts of technological devices housed within the car, most of which you can take advantage of every day. A rear reversing camera helps reduce the hassle of parking in bays or on the road while an on-board computer will tell you everything about how the vehicle is performing, how much energy is being used, all via a seven inch touchscreen display. You can control the aircon from your smartphone as well as check up on the charging process and as if things were not ecological enough there is an eco setting which reduces the power of the motor to save energy. Rain-sensing wipers, automatic headlights and automatic folding electric wing mirrors makes sure that it is advanced on the inside and out. One of the only optional extras available for the Nissan Leaf is a rear spoiler. This is not just some aesthetic adjustment as it actually has integrated solar cells. This is a very sensible feature as it will help the car to recharge using the sun’s power alone and could stretch out its usefulness even further. 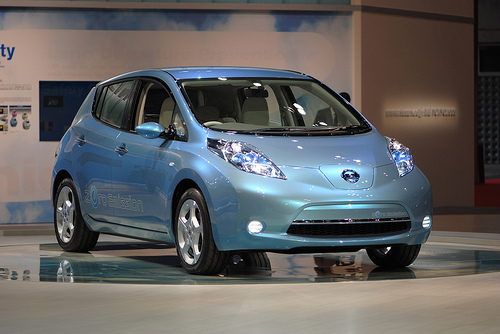 While this is an electric car the Nissan Leaf is no slouch when it comes to performance. Its single-gear electric engine provides speeds of over 90 miles per hour and provided you do not use the air conditioning it will be able to live up to its promise of a 109 mile range. With cruise control and automatic speed limiting you can be sure of driving as efficiently as possible and free car insurance quotes will quickly indicate how much you will be paying for the car each year. Free car insurance quotes will also help when comparing it against other electric vehicles, as running costs can differ.